A record number of hareidi-religious men signed up voluntarily to the Israel Defense Forces this July, and were received enthusiastically by a man who many of them view as a role-model. Four hundred hareidi enlistees listened as hareidi Yesh Atid MK Rabbi Dov Lipman congratulated them on their decision to join the Israeli army. Currently, unlike other Jewish Israelis, hareidim do not have to enlist in the army. Although the current government is working to change that arrangement, amid strong feelings and fierce debate, any changes in the law will not take place until next year. Nevertheless, every year a growing number of hareidi men voluntarily enlist - sometimes in the face of intense pressure and even hostility from their families and local communities. Those who opt to join combat units usually enlist in the "Nahal Hareidi" (or "Netzah Yehuda") battalion, which was founded 1999 to enable hareidi-religious Jews to serve in the IDF in an atmosphere that catered to their religious convictions. It originally started with just 30 volunteers, but now on average has around 1,000 soldiers. MK Lipman was among a number of other Knesset members from the Defense and Foreign Affairs Committee and the special Knesset committee for the law for equality in national service who greeted today's recruits, as they entered their enlistment base. 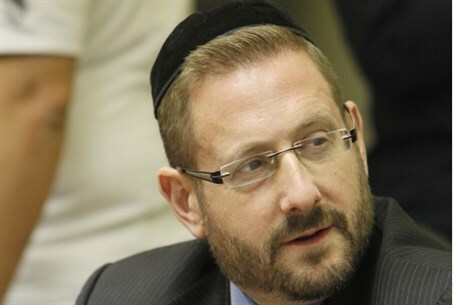 An outspoken advocate of hareidi integration into Israeli society, proud "hareidi-Zionist" and a supporter of the enlistment bill, Rabbi Lipman has faced harsh criticism and even verbal attacks by many more conservative hareidi figures. Yet for the growing hareidi middle-class he is seen as an example of how being a part of wider Israeli society does not necessarily mean abandoning the hareidi way of life. "I was happy to meet with military leaders who explained how the Nahal Hareidi meets the needs of the hareidi young men on all fronts and also how much these young men are needed in the army," he said. Addressing the critics of government legislation to apply the mandatory draft to the hareidi community, he dismissed their claims as "misinformation." "We talked about the need to correct the misinformation which is spread throughout the hareidi street about less hareidim enlisting because of the new law, about the army not needing hareidi soldiers, and about the religious needs not being met by the army," he added. MK Lipman described his feelings at seeing so many hareidi men - black kippot (skullcaps), tzitzit (fringes), and peiyot (sidecurls) - proudly volunteering to serve their country. "I am so proud of you," he declared, "I am actually jealous of you. The army would not take me for service when I made Aliyah nine years ago because of my age and number of children. "You are blessed with the opportunity to observe Torah and mitzvot to the fullest and serve in a Jewish army in a Jewish state. You will be able to serve an example to other hareidim and have an important role as ambassadors for the hareidi community. "May God be with you and we are here to help you in any way needed." During the meeting, two soldiers asked for Lipman's contact information. Their families are not supportive of their enlistment, and MK Lipman offered to host them in his home for shabbat and when they are off from service. There are roughly 3,500 hareidi soldiers in the army per year, and the IDF hopes that number will grow to 10,000 within the next five years. A new poll published by the IDF has revealed positive attitudes toward service among hareidi soldiers. An overwhelming majority of respondents – 90% - said it is important to them that they excel in their role in the IDF. Eight-five percent said they are proud to serve in the IDF. Seventy-two percent said they believe their work in the IDF benefits them now, and 76% percent believe that their work in the IDF will prove beneficial to them in the future.